This is just a short note on a manuscript I cataloged this morning. It’s not a new find, but rather a confirmation of the existence and the whereabouts of a significant copy of Antony of Tagrit’s Rhetoric. 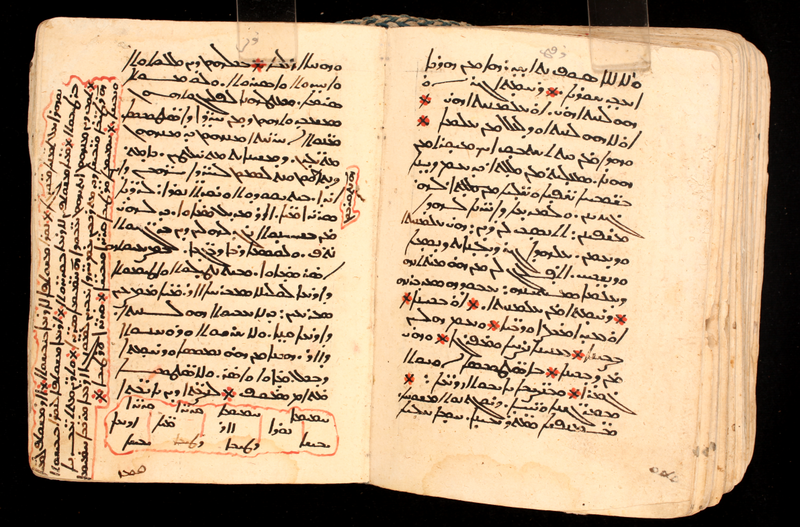 In the introduction to his edition of the fifth book of the Rhetoric (CSCO 480), John Watt, who has written extensively on the topic of rhetoric in Syriac (see the bibliography below), mentions a manuscript of the work known to have been at Saint Mark’s Monastery in Jerusalem (cf. Baumstark in OC 3 (1913): 132 [no. 32*]), and not a late copy: he gives 14th/15th/16th century, but he had apparently not seen the manuscript. He says of it that its location “since 1949 is also unknown” (p. xi). Breydy, Michel, ”Précisions historiques autour des œuvres d’Antoine de Tagrit et des manuscrits de St. Marc de Jérusalem”, Pages 15-52 in Erkenntnisse und Meinungen II. Edited by Wiessner, Gernot. Göttinger Orientforschungen, I. Reihe: Syriaca 17. Wiesbaden: Otto Harrassowitz, 1978. Corcella, Aldo, ”Due citazioni dalle Etiopiche di Eliodoro nella Retorica di Antonio di Tagrīt”, Orientalia Christiana Periodica 74:2 (2008): 389-416. Duval, Rubens, ”Notice sur la Rhétorique d’Antoine de Tagrit”, Pages 479-486 in Orientalische Studien: Theodor Nöldeke zum siebzigsten Geburtstag (2. März 1906) gewidmet von Freunden und Schülern. Edited by Bezold, Carl. Gieszen: Alfred Töpelmann, 1906. Eliyo Sewan d-Beth Qermaz,, ed. The Book of the Rhetoric by Anthony Rhitor of Tagrit. Stockholm: Forfatteres Bokmaskin, 2000. Eskenasy, Pauline Ellen, ”Antony of Tagrit’s Rhetoric Book One: Introduction, Partial Translation, and Commentary”. Ph.D. dissertation, Harvard University, 1991. Köbert, Raimund, ”Bemerkungen zu den syrischen Zitaten aus Homer und Platon im 5. Buch der Rhetorik des Anton von Tagrit und zum syrischen Peri askeseos angeblich von Plutarch”, Orientalia 40 (1971): 438-447. Raguse, Hartmut, ”Syrische Homerzitate in der Rhetorik des Anton von Tagrit”, Pages 162-175 in Paul de Lagarde und die syrische Kirchengeschichte. Göttingen: Göttinger Arbeitskreis für syrische Kirchengeschichte, 1968. Rahmani, Ignatius Ephraem, ed. Studia Syriaca, seu collectio documentorum hactenus ineditorum ex codicibus Syriacis. Monte Libano: Typis Patriarchalibus in Seminario Scharfensi, 1904-1909. Rücker, Adolf, ”Das fünfte Buch der Rhetorik des Anton von Tagrit”, Oriens Christianus 31 (1934): 13-22. Seven d-Beth Qermez, E., ed. Antony Rhitor of Tagrit. The Book of Rhetoric. Södertälje: Författares Bokmaskin, 2000. Sprengling, Martin, ”Antonius Rhetor on Versification, with an Introduction and Two Appendices”, American Journal of Semitic Languages and Literatures 32:3 (1916): 145-216. Strothmann, Werner, ”Die Schrift des Anton von Tagrit über die Rhetorik”, Pages 199-216 in Paul de Lagarde und die syrische Kirchengeschichte. Göttingen: Göttinger Arbeitskreis für syrische Kirchengeschichte, 1968. Watt, John W., ”Antony of Tagrit as a Student of Syriac Poetry”, Le Muséon 98:3-4 (1985): 261-279. Watt, John W., ed. The Fifth Book of the Rhetoric of Antony of Tagrit. CSCO 480-481, Syr. 203-204. Leuven: Peeters, 1986. Watt, John W., ”Antony of Tagrit on Rhetorical Figures”, Pages 317-325 in IV Symposium Syriacum, 1984: Literary Genres in Syriac Literature (Groningen – Oosterhesselen 10-12 September). Edited by Drijvers, Han J.W. and Lavenant, René and Molenberg, Corrie and Reinink, Gerrit J.. Orientalia Christiana Analecta 229. Roma: Pontificium Institutum Studiorum Orientalium, 1987. Watt, John W., ”Syriac Panegyric in Theory and Practice: Antony of Tagrit and Eli of Qartamin”, Le Muséon 102:3-4 (1989): 271-298. Watt, John W., ”Grammar, Rhetoric and the Enkyklios Paideia in Syriac”, Zeitschrift der Deutschen Morgenländischen Gesellschaft 143:1 (1993): 45-71. Watt, John W., ”The Syriac Reception of Platonic and Aristotelian Rhetoric”, ARAM 5 (1993): 579-601. 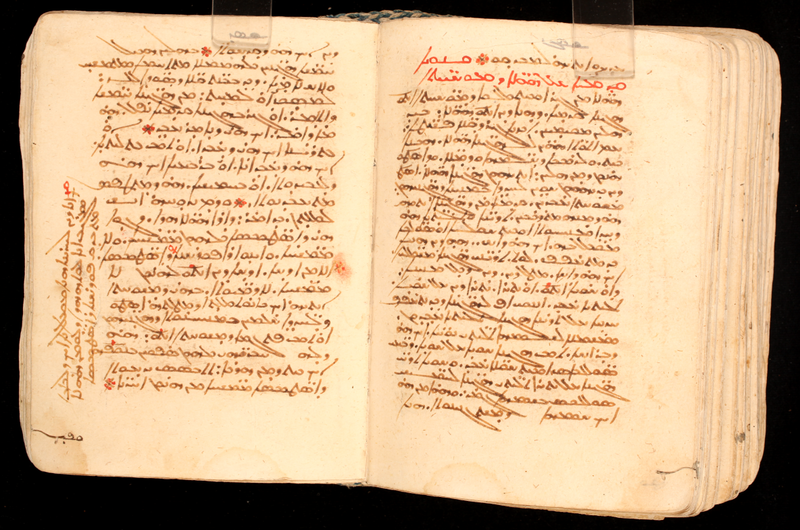 Watt, John W., ”Syriac Rhetorical Theory and the Syriac Tradition of Aristotle’s Rhetoric”, Pages 243-260 in Peripatetic Rhetoric after Aristotle. Edited by Fortenbaugh, William W. and Mirhady, D.C.. Rutgers University Studies in Classical Humanities 4. New Brunswick: 1994. Watt, John W., ”The Philosopher-King in the “Rhetoric” of Antony of Tagrit”, Pages 245-258 in VI Symposium Syriacum, 1992: University of Cambridge, Faculty of Divinity, 30 August – 2 September 1992. Edited by Lavenant, René. Orientalia Christiana Analecta 247. Roma: Pontificio Istituto Orientale, 1994. Watt, John W., ”Eastward and Westward Transmission of Classical Rhetoric”, Pages 63-75 in Centres of Learning: Learning and Location in Pre-Modern Europe and the Near East. Edited by Drijvers, Jan Willem and MacDonald, Alaisdair A.. Brill’s Studies in Intellectual History 61. Leiden / New York / Köln: Brill, 1995. Watt, John W., ”From Themistius to al-Farabi: Platonic Political Philosophy and Aristotle’s Rhetoric in the East”, Rhetorica 13:1 (1995): 17-41. Watt, John W., ”From Synesius to al-Farabi: Philosophy, Religion, and Rhetoric in the Christian Orient”, Pages 265-277 in Symposium Syriacum VII: Uppsala University, Department of Asian and African Languages, 11–14 August 1996. Edited by Lavenant, René. Orientalia Christiana Analecta 256. Roma: Pontificio Istituto Orientale, 1998. Watt, John W., ”The Recovery of an Old Text: Scribes, Scholars, Collectors and the Rhetoric of Antony of Tagrit”, The Harp 16 (2003): 285-295. Watt, John W., ”Guarding the Syriac Language in an Arabic Environment: Antony of Tagrit on the Use of Grammar in Rhetoric”, Pages 133-150 in Syriac Polemics: Studies in Honour of Gerrit Jan Reinink. Edited by van Bekkum, Wout Jac. and Drijvers, Jan Willem and Klugkist, Alex C.. Orientalia Lovaniensia Analecta 170. Leuven: Peeters, 2007. Watt, John W., ”Literary and Philosophical Rhetoric in Syriac”, Pages 141-154 in Literary and Philosophical Rhetoric in the Greek, Roman, Syriac and Arabic Worlds. Edited by Woerther, Frédérique. Europaea Memoria I.66. Hildesheim: Olms-Weidmann, 2009. 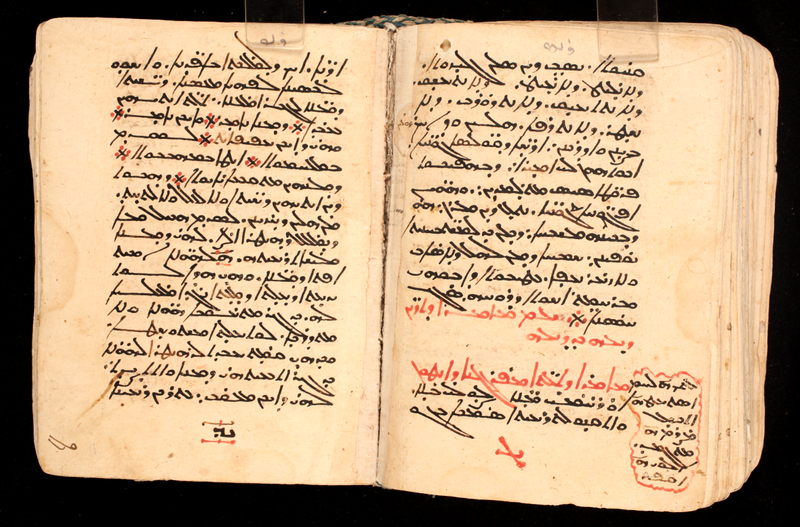 Watt, John W., Rhetoric and Philosophy from Greek into Syriac. Variorum Collected Studies 960. Farnham, England: Ashgate, 2010.